School : Teacher :: Court : ? विद्यालय : शिक्षक : : अदालत : ? Except FHJ, rest all follows +4 pattern. hello, lower, error, originate, tense, ? Last two letters of a word are the first two letters of the next word. Q5. A series is given, with one number missing. Choose the correct alternative from the given ones that will complete the series. Q6. The weights of 4 boxes are 30, 70, 60 and 90 kilograms. Which of the following cannot be the total weight, in kilograms, of any combination of these boxes and in a combination a box can be used only once? 4 बक्सों का वज़न 30, 70, 60 और 90 किलो है. निम्नलिखित में से कौन सा इन बक्सों के संयोजन का कुल योग नहीं हो सकता और एक संयोजन में एक बक्सा एक ही बार इस्तेमाल होगा? Q8. Select the missing number from the given responses . Q9. A man walks 6km to the east and then turns to the south and walks 5 km. Again he turns to the east and walks 6km. Next, he turns northwards and walks 10km. How for is he now from his starting point ? एक व्यक्ति 6 किमी पूर्व की ओर चलता है और फिर दक्षिण की ओर मुड़ जाता है और 5 किमी चलता है. वह फिर से पूर्व की ओर मुड़ता है और 6 किमी चलता है. वह उत्तर की ओर मुड़ता है और 19 किमी चलता है. वह अब अपनी शुरुआती बिंदु से कितनी दूर है? Q10. Looking at a portrait of a man, Harsh said, “His mother is the wife of my father’s son. Brother and sisters I have none.” At whose portrait was Harsh looking? एक आदमी के चित्र को देखते हुए हर्ष ने कहा, “उनकी मां मेरे पिता के बेटे की पत्नी है. मेरा कोई भाई और बहन नहीं है. ” हर्ष किस के चित्र को देख रहा था? Sol. Since Harsh has no brother or sister, so he is his father’s only son. So, wife of Harsh’s father’s son—Harsh’s wife. Thus, Harsh’s wife is the man’s mother or the man is Harsh’s son. Q11. In the question two statements are given, followed by two conclusions, I and II. You have to consider the statements to be true even if it seems to beat variance from commonly known facts. You have to decide which of the given conclusions, if any, follows from the given statements. Statement 2 : No day is night. /कथन 2: कोई दिन, रात नहीं है. Conclusion I : No night is day./निष्कर्ष I: कोई रात, दिन नहीं है. 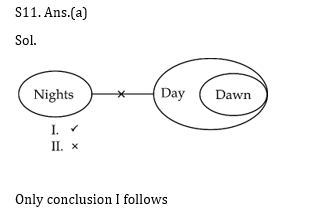 Conclusion II : Some dawn is night./निष्कर्ष II:कुछ सुबह, रात है. Q12. Which of the following cube in the answer figure cannot be made based on the unfolded cube in the question figure? Q13. 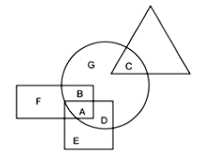 In the following figure, square represents Runners, triangle represents Scientists, circle represents Indians and rectangle Mothers. Which set of letters represents Indians who are runners? निम्नलिखित आकृति में, वर्ग धावकों का प्रतिनिधित्व करता है, त्रिभुज वैज्ञानिकों का प्रतिनिधित्व करता है, सर्कल भारतीयों और आयताकार माताओं का प्रतिनिधित्व करता है. पत्रों का कौन सा सेट भारतीयों का प्रतिनिधित्व करता है जो धावक हैं? Sol. Set (A + D) represents Indians who are runners. Q15. 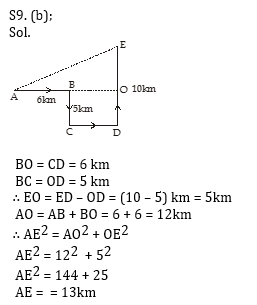 From the given answer figure, select the one in which the question figure is hidden/embedded.